A timid jumping spider uses the scent of ants as a secret weapon to save itself from becoming the somewhat soggy prey of the predatory spitting spider. The downside to this plan is that jumping spiders are also a favorite snack of its very own saviors. To overcome this additional hazard, the spider has made yet another plan in the form of an ant-proof nest, writes Ximena Nelson of the University of Canterbury in New Zealand and Robert Jackson of the University of Canterbury and the International Centre of Insect Physiology and Ecology in Kenya, in Springer's journal Behavioral Ecology and Sociobiology. The protector species, the weaver ant Oecophylla smaragdina, can also turn predator of the associate species, the jumping spider Phintella piatensis. The researchers found that jumping spiders choose nesting sites based on whether they can see active living ants, if they detect ant odor or can see mounts made from dead weaver ants. However, it's not yet plain sailing for the jumping spider, as it is also a favorite snack of its savior, the weaver ant. Therefore jumping spiders build dense ant-proof nests of an unusually tough and dense weave that are difficult for the insects to tear open. The nest's hinged flaps of silk at each end function as swinging doors. The spider quickly raises these when it enters or leaves the nest, before any ants can follow, too. "Nesting associations with territorial ants whereby the ant does not receive any benefit may be more common among arthropods than is currently appreciated," concludes Nelson. 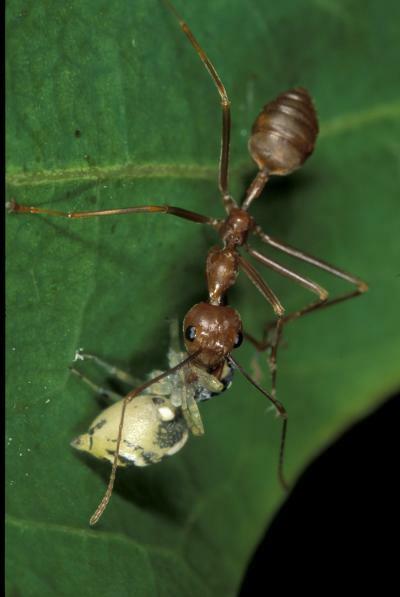 "We expect that a closer look at ant-other arthropod relationships will yield numerous examples similar to ours and provide a better understanding of the complexities of microhabitat choice and its ecological ramifications."